The Tarot can often provide an insight into things that we already know. We sometimes need to understand a situation at a deeper level. You understand what’s happened, but not the why. Perhaps you know both, but need insight to help you “get it” so you can move on. I was asked this question via Twitter: I know why my short-term memory is a bit foggy of late. What insight can I gain to aid in crispness & focus? I created a small spread to answer this question, which you’re free to re-use, should you wish. What should I remember for my focus? The Sun answers, reminding us that we need to feel the warmth of things upon us. This card reminds me of summer, the smells of it can be remembered even in winter. It’s the gift of memory. Use the senses we were given. The smells, the sights, the sounds. The smells especially are what I see with this card. What should I remember for my crispness? The Queen of Stones is the most practical minded of all the Queens. Bears fatten up over the summer, ready to hibernate. They take practical steps to survive the harsh winters that were once known in this land, which is what I feel this card is saying to you here. Take practical steps. The Queen of Stones doesn’t suggest note things down, but if putting things you need to remember into words helps you, then that is something I feel you should follow. What is the best insight for me now? The Knight of Vessels is an adaptable character. He can swim in water, creep over land. He moves and changes depending upon the circumstances that he encounters. This is the best insight for you now. Adapt. You’ll no doubt have good days & bad days. Now is time to be gentle with yourself. When you have good days, please enjoy them and put them into your focus, remember how the days smelled, what thoughts are triggered by the smells. It’ll make the bad days not so bad. There are a few things you can do my lovely. It’s time to use all your senses to help keep your crispness & focus. Remember to be adaptable, try writing things down, take the good & the bad days. It’s time to adjust and adapt to the new situation you’re in. You can do this though, says the Knight of Vessels: It’ll need some adjustment from what you’re already used to, to the slight changes the Queen of Wands says that you need to do going forward. Be kind to yourself in the first instance. 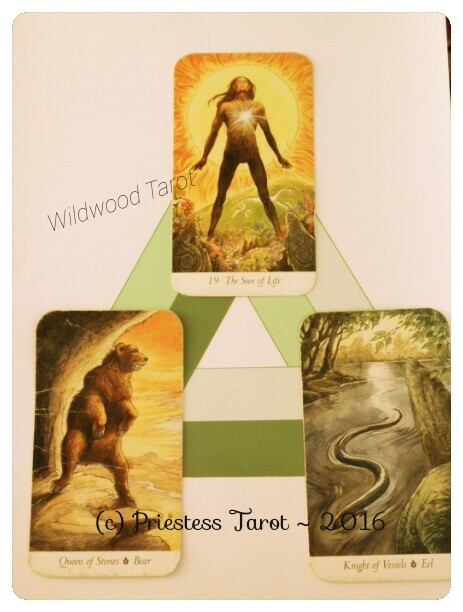 I use the Tarot as a tool for personal insights, focusing particularly on The Wildwood & how messages from the Pagan aspect of our society may actually help us. I hope you enjoy!